Since Wolfgang Pauli proposed the neutrino in 1930, and its subsequent discovery in 1956/1957 by Reines and Cowan, this tiny little particle has proved more mysterious than anyone had originally imagined. It is currently the only messenger of beyond the Standard Model physics in particle physics today in the shape of neutrino oscillations which require the neutrinos to have mass. Recent experimental evidence from experiments such as LSND and MiniBooNE even suggests that there could be so-called sterile neutrinos that do not interact via normal forces at all. In recent years it has become accepted that in order to make the next leap forward in neutrino physics detectors of fine granularity and resolution have to be used which would allow for excellent background rejection and signal selection. 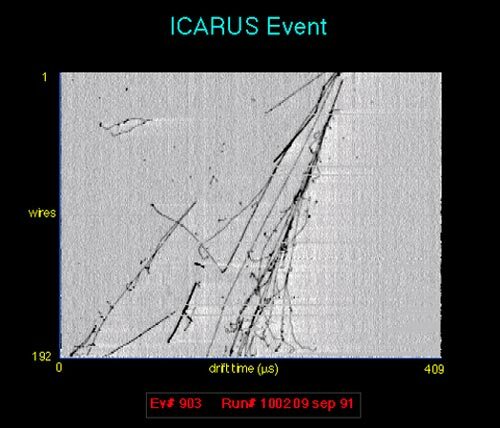 The two images show two example real data event displays from the ArgoNeut and ICARUS experiments. The mm-level spacial resolution of LAr detectors, combined with real-time 3-D tracking of the events, is a key step towards achieving high-statistics neutrino event samples of high purity and efficiency by using sophisticated event selection techniques such as neural networks. The UCL liquid argon activities have grown substantially over the past few years. We are now actively involved in several liquid argon experiments (DUNE, SBND, and WA105) and have also developed our own liquid argon test stand (LARA) to help with our contributions to those experiments and carry out liquid argon detector R&D. More information about the different areas of work can be found following the links above or in the menu on the left. For any general questions please contact Dr Anna Holin.